There are certain periods of time that cause us to pause: a week, a month, a year. A decade is also one of those periods. Somehow, the passing of a decade seems significant for us, a period to reflect upon for an anniversary, in a way that for example nine or eleven years simply isn’t. A decade gives us sufficient distance from an event to reflect more thoroughly in a way, that, for example, five years does not. Perhaps that distance is all an illusion: we can never be far enough from an event we’ve lived through to be have true reflection? The word “decade” comes from the Greek for group of 10. Yet, humans have not always had an affinity with counting in tens. Indeed, the Babylonian system of counting revolved around the number 60. That relic is still with us today, with the way an hour is split into 60 minutes and minutes are split into 60 seconds. From ancient time to the present day, time is one of things we love to measure, perhaps because it is so difficult to grasp, and uncontrollable. We can feel it passing, a wave, to surf momentarily, but it passes too quickly to appreciate it. Our entire existence seems based on the premise of making moments in time somehow count, memories to be remembered. Those flags of memories planted in sand, continually weathered away by the ages, staking a claim to times gone past. A decade ago, I was a fresh-faced graduate, several years out of college. Those memories of a decade ago have been piled up in my mind, slightly blurred and out-of-focus, little post-it notes haphazardly affixed to the inside of my mind. The impending anniversary seems to have temporarily made those memories far sharper and easier to recall, irrespective of whether they were good or bad, they seem some curious mishmash of both. It impossible to have good memories, without having bad (and indeed vice versa). It would be some boring to a monotonous consistency, where every memory simply seemed “good”. My mind was a myriad of maths and coding, something which hasn’t changed in the intervening years. There is something faintly reassuring about maths and the certainly of being able to prove certain notions. Yet, maths is just an abstraction of real life. A statistical model, is a model, an approximation. Real life is far messier than that, something which seems more evident in the decade that has passed. Looking back at my photos from a decade ago, I notice the hair had already begun to thin, still not punctuated by the spicks and specs of grey, which are prevalent today. The cheeks were somewhat thicker, rounder, redder, a testament to the everlasting power of KFC and Coca-Cola, surrounding an ever-present chirpy smile. I remember at the time being told by a colleague that I would become jaded and somehow more cynical. I suppose I have changed: life has happened since then, but thankfully, I’m not jaded. I still find it harder to frown than to smile, there seems little rationale for striking away the seconds that chip away at life in dejection and my love of junk food has evolved towards embracing burgers alongside the Colonel’s secret recipe – that, my friends, is progress! I had the habit of making the awful of puns, which seem to gravitate ever more forcefully towards mediocrity with age, much to the dismay of my friends. The naivety which I had in abundance then, is still there, more convincingly masked by the deepening lines on my face, age does not seem to have dampened my ability to make ill-fated decisions, although age has made it far easier to learn from them, and has given me a better (if somewhat incomplete) understanding of the concept of risk and reward. As for being more cynical, I suppose that was an inevitability. Whilst youth is the antithesis of cynicism, age is drawn to it. Immediately after graduating, I joined. I had yet to be indoctrinated into the world of work. It only took a few months to make that mental shift from college student to analyst and corporate life. I learnt the lingo of the markets. It seemed more than a job at the time, most likely because it was my first permanent role. I ended up staying three years there, right up until the end. I made many friends there. I am still in touch with many of them. When I joined, we were on the ascendancy. We were Goldman’s rival, bathed in green, our company colour, which was virtually the same shade as British Racing Green, perhaps an ill-fated choice – after all, the colour green didn’t bring us much luck. Unlike Goldman, we were never destined to survive the tumult. Our CEO was nicknamed the Gorilla, supposedly for his streak of competitiveness. In retrospect, it was perhaps an apt of nickname, for entirely different reasons, a gorilla is unlikely to back away from dangers, such as over leveraging on a toxic diet of sub-prime assets. In the summer of 2007, the credit crunch began to bite, the mood began to change internally. The company town halls used to be boring and passable affairs. Suddenly, they became more serious. Our head of fixed income, Andy Morton, tried to reassure us we had funding for a year. Perhaps, today he would have quipped that we had funding secured. Something had started, that was clear, yet, it was difficult to predict quite how it would end up. Over the past decade, we’ve heard all the stories of those that put on “The Big Short”, betting against sub-prime to cash in a fortune. They were obviously in the minority and not all have been as successful since then. Making one big call could be luck, making many is less likely to simply be a matter of luck. I was sitting in foreign exchange markets of the bank, it was like being a passenger, feeling the car jerking from side to side in motion, but without the ability to see through the windows, to see the distress in credit markets. Our foreign exchange desk was still relatively small compared to most in the industry, but it had grown substantially both in headcount and profitability. Somewhat ironically, it even was on course for a record year in 2008, had we survived. Like many flow based desks, foreign exchange as a business thrives with market volatility. I still remember seeing bright bar chart presentation with revenue figures pointing higher and higher. The positive revenue picture was clearly not shared by every desk in the bank that year. The bail-out of Bear Sterns was in retrospect the inevitable turning point. At the time, it was a shock. I was in New York at the time, doing associate training at Lehman Brothers, which was preparing us for our next few years there. Isn’t that ironic, as Alanis Morrissette as once sang? It was perhaps a perversely reassuring sign that, maybe, just maybe should the time come, Lehman would be bailed out too. Weeks later, our stock price appeared to be the one followed by the market, never a particularly good sign, when it is plummeting. Of course, Lehman Brothers, my employer was not bailed out, setting off the near collapse of the financial system. One hundred and fifty years of a business had dissolved to nothing. The rest of the banks were bailed out. Lehman was not. Perhaps, gorillas are not the greatest at making friends? Whether we agree or disagree with that policy, what Lehman demonstrated was the risks of not bailing out institutions, which had become too big too fail. It could be argued that it was necessary for a bank like Lehman to go down, and its impact was necessary to galvanise support for a wide spread bailout. I will never claim to know this answer and much has been written about the decision to let Lehman go. I have many memories of the period of Lehman’s bankruptcy. I remember being in a state of sleep and consciousness, awaiting the announcement that Lehman had declared bankruptcy, aimlessly starting at the markets tick up and down. It was odd coming into work, several hours after the bankruptcy was announced. Outside, photographers were lined up, waiting to take photos. Inside Lehman’s office, I was taking photos of those photographers (picture above). There was clearly no work to do, other than to find new work. Yet, somehow it was reassuring to have something to do and coming to work each, gave me that. I recall the administrators calling our division into Lehman’s main auditorium on a loudspeaker at then end of September 2008. It had been two weeks since the bankruptcy had been announced. Once all inside the auditorium, they told us to leave work later that day. It was no shock, because at that time no buyer had been found for the division where I worked (fixed come Europe). 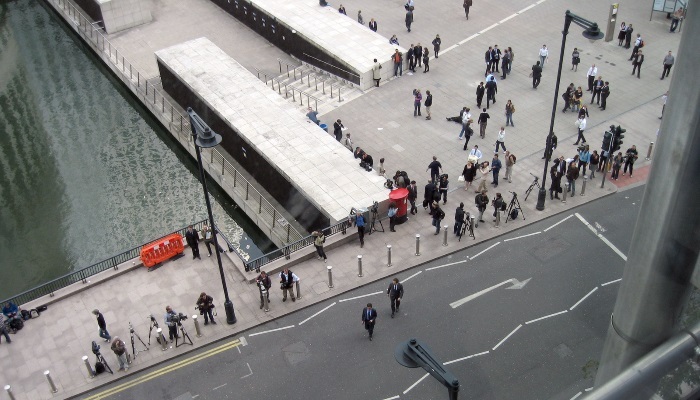 It was easy to tell who was a Lehman employee around Canary Wharf that day, they had in their entourage either a carrier bag, or the more organised among us had boxes alongside them. I left Lehman that day, carrying a carrier bag with a few paltry belongings harvested from my desk, including curiously, an evacuation kit emblazoned in Lehman’s logo and all manner of other corporate memorabilia. Ultimately, a lack of appreciation for risk, and leverage destroyed the business. I do not want to wallow in self-pity, after all, I found a job within a few weeks of Lehman’s demise, after Nomura took on a large number of former Lehman employees in fixed income. It was simply a small inconvenience, in particular compared to the devastating impact of the financial crisis on many others. Of course, the bankruptcy had an impact in terms of alternating my path, sometimes I think for the better: from anything bad, its important to at least learn from it. I started going to gym in the immediate aftermath of the collapse. I am certainly no six-pack wielding muscle bound man today: my penchant for burgers renders that an impossibility. I’m sorry, when the choice involves burgers and something else, whatever it is, burgers will always win for me. I feel fitter and healthier today than I did during my time at Lehman, when the gym was one of those places I avoided. Also several months after Lehman’s collapse, my friend and fellow ex-Lehmanite, Paul Bilokon, founded the Thalesians a quant think tank, which I and Matthew Dixon co-founded with him, which still exists today. One of the main motivations was trying to understand what precisely went wrong. The whole episode also inspired me to write a book called Trading Thalesians: What the ancient world can teach us about trading today. Had Lehman survived, I always wonder how my life would have been different. Would I still be working there, in the throes of corporate life, and with a grandiose corporate title, and an embossed nameplate? Perhaps, I would have been married? I have no idea. Several years ago, I decided to write about my time at Lehman, in an article which was syndicated by Business Insider. In a sense, the impact of the financial crisis has been just as great (or perhaps greater) in the years since I wrote that article, from a political perspective. Of course, there had been a direct impact on markets and the broader economy already, very quickly after Lehman’s collapse, but the political ramifications are still in play. Would we have had the Brexit vote, if the financial crisis hadn’t been as severe coupled with the policy of austerity? Would a president formally best known for saying the words “your fired” and appearing on WWF wrestling be sitting in the White House? I do not know. Perhaps, all these things would have happened anyway. However, it seems folly to think that the financial crisis made these events less likely. Five years ago, I quit banking, perhaps it was Lehman’s demise which started the process of uncorporatising me, if such a word exists. I certainly haven’t turned my back on markets though. I still love markets as much as I’ve ever have done, despite Lehman. I still reach for my phone to check where EUR/USD is trading, when I wake up (I really shouldn’t admit to that, should I?). There’s a certain adrenaline rush from watching them ebb and flow, observing the price changes, trying to forecast what they do, however difficult that continually seem. However, I’m more excited by concept of startup life, than corporate life. To use perhaps a euphemism, startup life is somewhat volatile, but with that comes more freedom. I’m currently working in a fintech startup, Cuemacro, still focused on currencies, as I have been on my whole career, and I have to admit I enjoy trying to find out the intricacies what drives currency markets just as much as I did at Lehman, perhaps even more so now. When I graduated, banking was seen as a very exciting career. Today, banking is no longer the bastion of the future. Graduates instead seek out the Googles and Facebooks of the world first, rather than the financial institutions, which had to be bailed out in the financial crisis. Perhaps, for society this fact is no bad thing. The financial sector is designed to facilitate the movement of capital and needs to be of a sufficient size to do so, rather than becoming an oversized behemoth which takes risks at the expense of the rest of society. Today, banking is hamstrung by regulation and a lack of appetite for risk taking, and rightly so, given the mistakes of the financial crisis. Of course, another crisis of the same magnitude will happen again, when the mistakes fade from memory, regulations are relaxed, and a new way to leverage up will be discovered. Even since Lehman, we have already had crises elsewhere, notably the Eurozone crisis, and more recently, the tumult in Turkey and Argentina. It won’t be CDOs or sub-prime next time, just another crazy manifestation of the notion that somehow risk can be totally decoupled from reward. There’s a human fascination with greed. As Gordon Gecko said “Greed, for lack of a better word, is good.”, and as he argues it is what drives us forward. The difficulty is when its “our” greed comes about whilst others are taking the risk, a point which has been repeated by many since the collapse. That perhaps is the main lesson of Lehman’s demise. Of course, the lessons learnt from Lehman are inevitably destined to be disposed of. ← What does a quant need from alternative data?